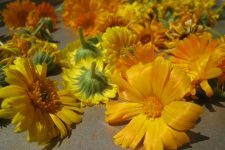 After the post on how and why to grow Calendula, many of you asked for tips on processing the abundance of fresh flowers. So today we will learn how to harvest, preserve, and infuse this amazing medicinal plant…and tomorrow we should probably talk about recipes! In order to harvest Calendula flowers and petals for medicine making, it’s best to pick them at their peak — and pick them frequently. 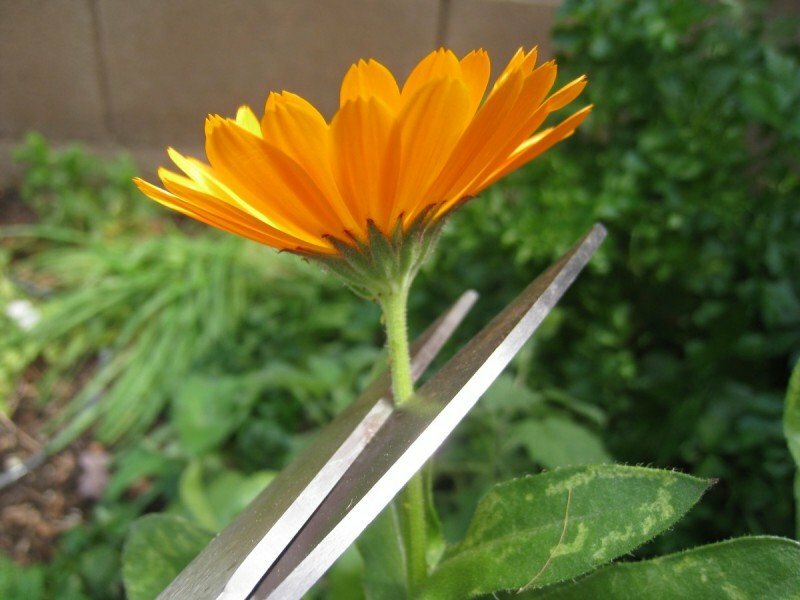 Begin harvesting the Calendula as soon as the first flowers open fully and then continue throughout the spring and summer season. Trust me when I say…you can’t pick these often enough, the more flowers you pick, the more flowers your plant will produce. Usually — in ideal growing conditions and peak season — this means you should be harvesting every 3-4 days. Harvest mid-day, when the flowers and foliage are dry, and after the dew from the morning has evaporated. Then cut the stems, as close to the flower head as possible. Remember: You really can’t over pick these flowers! Harvesting the beautiful flower heads forces the plant to send out more buds. 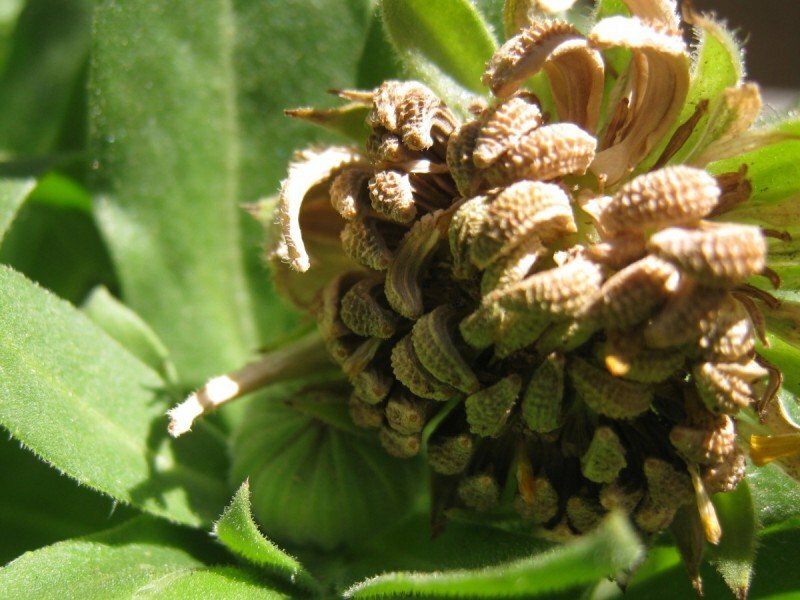 In fact, under harvesting will cause the flower heads to go to seed and stop producing quickly. Collect the flower heads. If you are attempting to control the spread of the plant in your garden, you’ll want to collect the flower heads. Otherwise, Calendula will reseed itself and spread rapidly throughout the garden. When collecting the seeds, allow them to turn brown. Don’t gather the green ones! Let them to dry on the plant, but watch them carefully. I love to collect the seeds and give them as gifts. Allow the seeds to do what the will. In my garden, I have allowed nature to control the process. I prefer this method, as the stray plants are easy to pull from the ground, and it hasn’t been that difficult to maintain. Over the years — by allowing the flowers to reseed on their own — my Calendula garden keeps getting better and better. Just as we preserve (i.e. can, dehydrate, freeze) and store common foodstuffs — we must learn to preserve medicinal herbs and flowers. Drying, tincturing, and freezing are all effective methods of preserving herbs and flowers. 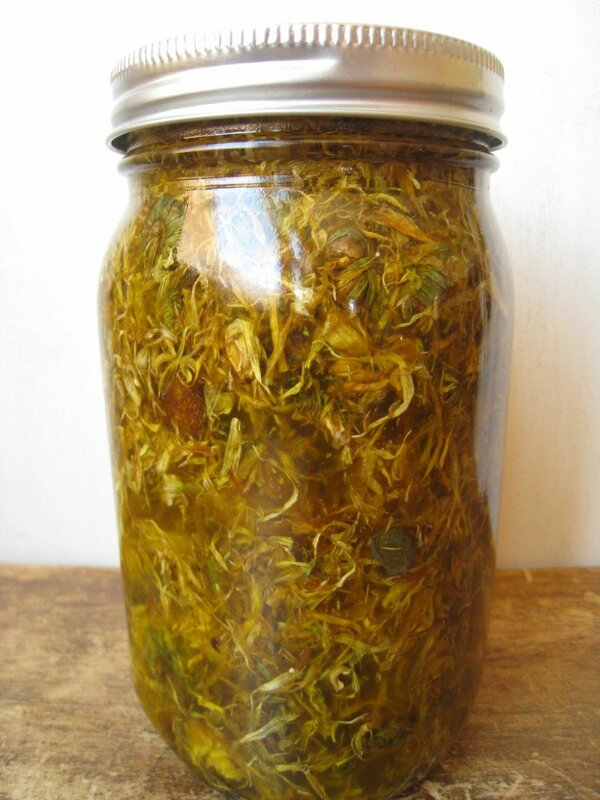 Drying Calendula is the most common way to preserve the medicinal properties of the flower. Not to mention, harvesting and preserving Calendula during the spring and summer, when the flowers are in abundance, will help keep your costs low throughout the year. Upon harvesting the flowers, bring them indoors — away from direct sunlight. Do NOT wash the flower heads. It’s good to dry in small batches, immediately after harvest. Dry in a dark, well-ventilated space by spreading the heads out on a drying screen (i.e. an old window screen), cheesecloth, or re-purposed sheet. Note: Using a dehydrator is an option so long as the temperature does not exceed 95 degrees fahrenheit as Calendula is heat sensitive. Store the dried flowers — once they are crispy dry — in air-tight glass containers. Keep the flowers as whole as possible and store them in a cool, dry, and dark place. They will keep fresh approximately 6 months. Calendula-infused oils are an excellent way to utilize all of the powerful healing properties that are contained within the plant. It promotes the regeneration of new tissue, and provides soothing relief for damaged or injured skin when used in lotions, creams, and salves. 1. Choose your menstrum, or base. Basically, you need to choose an oil. A variety of good quality oils work well with Calendula. I love a nice, organic olive oil, but sunflower, sweet almond, grapeseed, apricot, and jojoba are all great too. It just depends how you will use the oil and the properties you’re looking for. Generally olive and sunflower are good in salves. As sweet almond, grapeseed, apricot, and jojoba are wonderful for creams and lotions. Place the dried flowers in a glass mason jar — enough to come a few inches below the rim of the jar — and then cover them with a good quality oil (i.e. olive, grape seed, jojoba, almond). Stir to combine well, and allow oil and herb mixture to steep for 4-6 weeks in a warm, sun-lit area — shake daily. Note: This is the preferred method due to the delicate nature of Calendula. In a hurry? Prepare a glass jar just as above, then place the jar in a pot on the stove, or in a crock pot, filled with a few inches of water on lowest setting (Be sure to put a towel on the bottom of the pot.). Infuse the oil and herbs on a super low setting for 4-8 hours, a day, or up to 3 days. Note: Watch the pot and add water as it evaporates. 3. Strain. Once the infusion period is complete, strain the oil and plant material through a cheesecloth or tea towel. Fear not, there will always be some sediment from the Calendula flowers…it’s natural and good. 4. 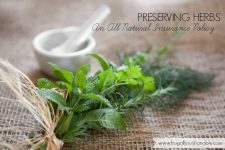 Add a “preservative.” I know that word has a negative feel, but I’m not talking about crazy chemicals here 🙂 Adding a little vitamin E oil (which adds nourishing properties), benzoin essential oils, or grapefruit seed extract will work to naturally ward off any mold or such. Note: This is not absolutely necessary…especially if you will be using the oil soon after infusion. A good Calendula infused oil should keep, without added preservatives for up to a year. 5. Label and date your jars. I always say I’m going to remember and I never do, so I’ve learned to date and label my jars upon shelving them. Looking for products mentioned in this post? Mountain Rose Herbs is my go-to for all my herbal and essential oil needs! Please share your tips and experiences with harvesting, preserving and infusing Calendula! Or are you new to the whole thing? Are you ready to try it this season? What questions do you have? The posts on Calendula have been encouraging. I find myself thinking “I can do this!” Please do one more that tells us how to use the oil once it has been infused. What is Calendula good for? Hi Barbara! Calendula is good for so many things. When taken internally, as a tea, it reduces the inflamation of the digestive system. When applied topically, through oil infusion, it is one of the best herbs for treating skin issues like burns, inflammation, cuts, scrapes, bruises, little wounds, rashes, eczema, and acne. It works like an anti-fungal, antibacterial, antiviral, and anti-inflammatory. Awesome! Thank you! I will definitely be growing some this year! So excited to see your post on Calendula lotion! My 2 yo and I both have sensitive skin and I buy California Baby Calendula cream for us, but it nearly breaks the bank! Your posts on Calendula are so encouraging, I think I’m truly ready to dive in and grow my own to help our family! Thank you SO much! Andrea: Where would I be able to read you post that you mentioned that you will be writing about a recipe for Calendula Lotion. I would love to make some, I have found that the only lip balm I can use is one I make using Calendula, I think a lotion would be wonderful. Barbara: I know this is an extremely old post but I felt compelled to add something 🙂 I used to sell Dr.Haushka cosmetic skin products that contained Calendula and I have never used anything that has helped my skin more than Calendula extract. I have sensitive skin that easily turns red when irritated and I occasionally break out and both these problems show up a lot because my skin is so fair. Calendula has amazing healing properties and it tends to calm inflamed skin as well as having anti-bacterial properties which helps for breakouts. Calendula quite expensive and so are these Dr. Haushka products so I have started growing my own flowers and making my own oil which I’m infusing now. I’ve not yet used it but I’m using sweet almond oil as a base for the Calendula and hopefully it’ll work out well. Keep it natural because as a beauty expert that has sold for ever brand under the sun, no chemically created compound can ever replace the the genius of nature. Good Luck! This is not specifically a calendula question or comment but I’m betting you’ll have an answer. How do I clean the greasy residue out of my old jars etc. I infuse my herbs by putting the jar with oil and calendula or other herb on a candle warmer for 8 – 12 hours. I’ve used this infused oil in my soaps and also lotions. Thanks for the push to grow calendula and label my infusions. In your comment, you said you make lotions. I have been looking for a recipe for one. 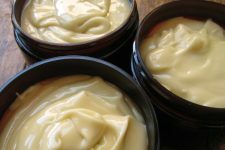 You see lots of recipes for salves and hard lotion bars, but not lotion type. Would you mind sharing ? This is what I’ve been looking for ! Thank you so much ! Thank you so much for this wonderful info on Calendula ! I am going to grow it in my garden this year. Calendula is so good for so many things. An excellent ‘staple’ to have around. Calendula is so good! Good luck growing it this year 🙂 You’re going to love it! I used to purchase Calendula from herb suppliers, but then I found out how easy (and cheap) it was to grow my own. My little calendula seedlings are doing wonderful! 😀 I use this herb to make salve, lotions, and lip balms. In the winter, infusing them in a warm, sunny window is a challenge, so I use a hot water bath technique to infuse them. I use my mini crock-pot with water and a washcloth. It works lovely. I recently posted about Calendula myself! It such a great herb, thanks for all the information! where do you get the seeds, and are teas made with leaves or flowers? Thank you! This is awesome!! I can’t wait to try it! One question – can you freeze any extra infused oil you have? Or is that not good? Awesome! We’ve got to start using what’s in our gardens! Great post! looking forward to more info. I, too, wanted to say thank you so much for this info. You have made it easy to do and very doable to newbies!! Also, I wanted to pass on that when I click the link to Simply clean it does not come through. Andrea, Thank you so much for your posts on Calendula! You’ve inspired me to grow my own and try to make oils with it. I just bought a couple of packs at WM and will put them in my flower bed soon. I am saving this page and the ones to come. Blessings from Bama! I absolutely LOVE LOVE LOOOOOOOVVVVVEEEE your blog! Every post is so informative, educational, and INSPIRING!! I have a raised bed in my garden that I have been wondering what to plant with, and guess what?…YEP…I’m going to plant Calendulas..probably TOMORROW!! I am so excited!! Thank you, Andrea, for sharing your WEALTH of knowledge so generously with all of us!! (Just pinned this…amongst the many other of your blog pages that are too good not to share with as many people as possible!!). I send you ABUNDANT BLESSINGS beyond your wildest imagination!!! BRAVO!!! Is Calendula Officialis the only marigold plant I should use? I’m having trouble finding the plant AND seeds in that particular variety. Other than buying online, do you have any suggestions as to where I might be able to pick one up? Or is online my best option? Thank you so much! I have had great success drying these by hanging them upside down in brown paper bags on my clothes drying rack. What ever seeds fall out stay in the sack. It stays dark so it retains color and I can place the whole thing in my spare bedroom, with the door shut, and run the dehumidifier to help the whole drying process along. Hi Andrea, Can you compost the oil-infused calendula after the oil has been strained? Hi, I love reading your blog!! This year I’m making infused oil for the first time, right now I’m making some plantain infused oil and when I get enough calendula flowers saved and dried I’m going to make some of that as well. I’ve read different things on different sites and blogs about how long to let it set in the sun (or not in the sun), everywhere from 1-6 weeks. How do you know when its “done”? And is it possible to let them infuse too long? Thanks! Thank you so much for all these great posts. My calendula are just tiny sprouts right now but I will be ready next year for a big happy patch of flowers. Thanks for this info! I have tiny, tiny black bugs in my calendula flowers and I can’t get all of them out. Will the dehydrator kill them? Any suggestions? Much appreciated! Did anyone answer you Vanessa? I’m having the same issue. Hello! Thanks so much for this post, it was just what I was looking for! I love using coconut oil, and I was wondering what you think about using that as a menstrum? I know it can be thick, but the smell and the properties are just right for me. Has anyone tried infusing coconut oil? I’m imagining it to be a bit tricky to keep it liquid through the infusion phase, but I’m sure I can come up with some creative solutions. Thanks!!! Thank you for the very informative article. I will be growing these flowers commercially this year, so I’m doing some research on this paticular flower. Can you tell me how many pounds of fresh flowers does it take to equall 1 pound of dry flowers? Thank you. I use the whole flower head. Once you have infused and strained the oil how long will it last in the jar? I will be making baby soap with it. Thank you. I read not to rinse the flowers once harvested, but what about the itty bitty bugs that are on them? I don’t love the idea of them going into the infusion. I think I just messed up. I went out to the garden and picked the calendula flowers, stuck them in a jar and poured sunflower oil over them, then sat it in a sunny window. 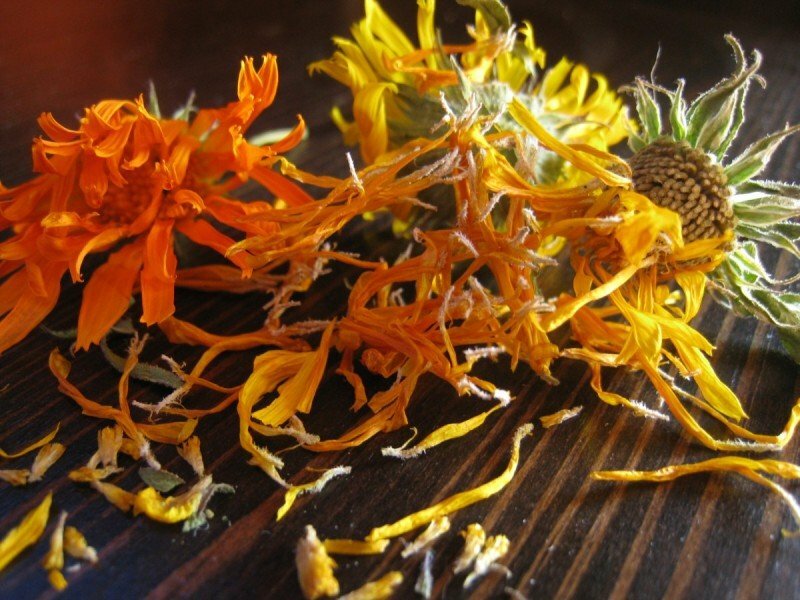 But now I see that most of the pictures i’ve found of calendula being infused looks like only the petals. Have I ruined this batch? My plants are still producing flowers. Will autumn blooms be as effective for infusing oil? I have age related macular degeneration and I have just started to harvest the flowers of the Calendula I planted, I wonder if anyone has any info on how much dried flower heads I would need to eat to give me the required dose of 6mg of Lutein per day or would the petals be better used in a tea. From what I can find out the color in the petals contains 80% Lutein but gives no indication of how much color is actually present in the flower only the percentage of Lutein in the color pigment which would be far less than the total weight of the petals. Hi There. 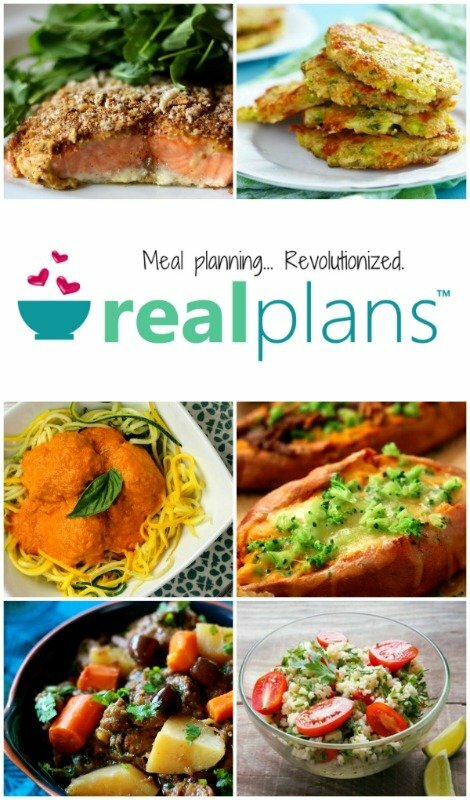 Have a quick question about infusing. I plan to grow my own Calendula and also Helichrysum Italicum (AKA Imortelle or Curry Plant) and infusing both of these flowers with Rosehip and Moringa oils (have both oils now and am growing the plants currently). I also further wish to add Evening primrose to the mix, but have not decided yet on trying to infuse with the other flowers or add this as an essential oil. I will be making an acne scar treatment. Would you recommend infusing directly with these oils, or infusing with a different base (if so, olive most likely) and adding smaller doses of these oils afterwards? I suspect infusion will work with just about any oil but since the rosehip and moringa are harder to come by, I’d like to get it right before infusing them and finding out they won’t hold the infusion. seen yet the foilage is like that of a marigold rather than a daisy. Am I growing the right plant?